An Interview with Rick Perlstein. · One Book. One Author. One Hour. An Interview with Rick Perlstein. 1:36 – Rick Perlstein’s book came to be on Booknotes because Brian Lamb was interested in the topic. 2:04 – Perlstein prepared for his book tour generally, but not for this interview specifically. 2:27 – Perlstein was not aware of Lamb’s service in the White House during the time period which his book covers. 4:14 – Perlstein remembers Lamb’s warmth and that he put him at ease. It was one of his first television appearances and Lamb’s open, democratic manner helped the young scholar feel comfortable. 5:25 – Perlstein was astonished at the detail the long-format interview allowed them to get into. There are no drawbacks to this longer format because it is so rare, most being short interviews. The format allows a rich, expansive conversation on complicated issues. 7:38 – Perlstein’s books are very long. Because of this, and because of the short-format of most interviews, he found the thoroughness of how Lamb read the books and prepared for the interviews to be very rare. 8:50 – Perlstein knows that readers find the process of writing interesting because that is what people always ask him. Based on this public interest, the fact that Lamb is one of the only interviewers who asks these questions is troubling. 10:30 – Perlstein was not surprised by being asked biographical questions because he was familiar with the program, but these types of questions are rare. 12:30 – Perlstein was surprised by the specificity of Lamb’s questions, focusing on details which could be marginal. For example, he spent a good bit of time going over Perlstein’s acknowledgements. 15:07 – Perlstein did watch the program before his appearance. This made him feel that Lamb was his friend before even appearing on the show. This feeling was solidified after his appearance, and the pair kept in touch following the interview. 16:28 – Perlstein thinks that the bare set could prevent the program from hooking viewers. However, it assists the interviewer and interviewee stay focused on the serious topics. 17:40 – Perlstein thinks that the Booknotes Collection is a great resource on American political thought and discourse, and those who write about it. A historian could use this archive to study the intellectual history of American politics. 18:34 – Perlstein would have absolutely appeared a second time if asked back. 18:52 – Perlstein thinks that perhaps his subsequent books were better, but is happy that he appeared on the program with his first book. It was a valuable experience in media training which also helped to launch his career. 21:00 – Perlstein’s book became influential in modern politics, his topic being slightly ahead of its time. 23:38 – Since appearing on Booknotes, Perlstein has been working on a series of books which make up a four part series on American politics and the rise of modern conservatism. 25:08 – The lasting impact of Booknotes was to give a voice to political writers of all persuasions, broadening awareness by bringing to the public-eye writers and books which don’t normally get popular attention. 25:51 – Perlstein learned new information about one of the players from his book by speaking with Lamb, so he wishes he’d interviewed him earlier so that he could have improved his books. He also discusses the extremism of conservative ideologues. Misha Griffith (Oral Historian) , “An Interview with Rick Perlstein.,” One Book. One Author. One Hour., accessed April 24, 2019, http://booknotes.gmu.edu/items/show/2805. 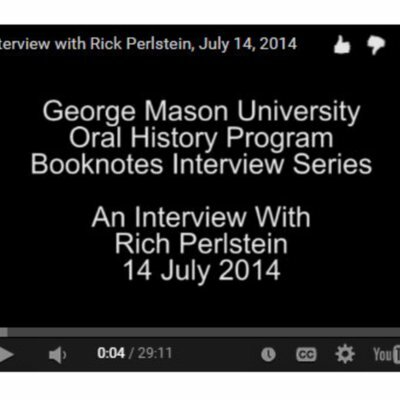 Rick Perlstein is interviewed as part of the Booknotes Oral History Project on 14 July 2014. Mr. Perlstein discusses his appearance on C-SPAN's Booknotes program on 3 June 2001, where he discussed his book "Before the Storm." Booknotes Oral History Series. R0143 Box 01 File 15.